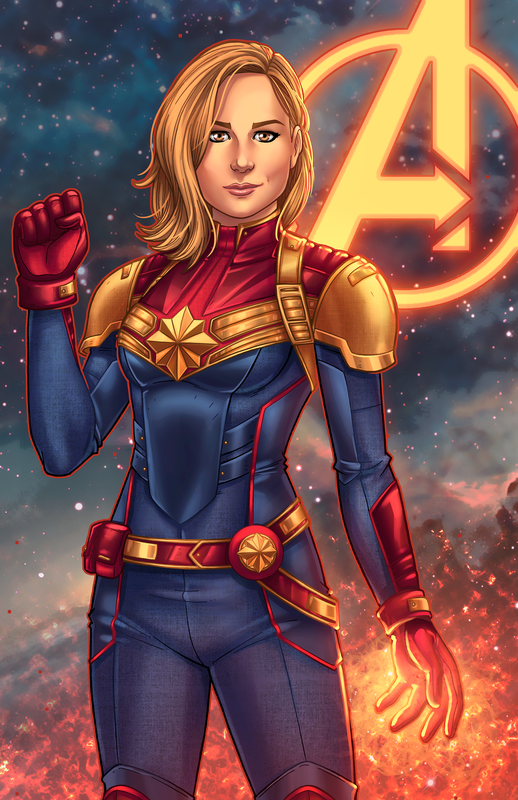 Here is my take and design for the costume for Brie Larson as Captain Marvel. I looked at pics of Captain America, Black Widow, Daisy Johnson and Maria Hill to come up with the look. What do you think? my idea for the color scheme. Awesome piece, I am SO looking forward to seeing her in action next year. Well done. Brie is no doubt perfect for Captain Marvel. MCU costumes tend to share the same design for some reason, so I would not be surprised if Carol Danvers ends up looking like Cap/Widow/Quake with her own color scheme. But I wish the MCU costumers would try some different things and not stick to the Y-shaped patterns. That's why I liked Dr Strange, finally it was different. On today's Nerdist News they were talking about the sneak peak Marvel gave the press recently and described this costume almost exactly and referenced it with credit to you. I was about to come and say the same thing. It's great news, because that picture looks badass. Can You Do The Helmet Version Of Captain Marvel? Sorry. I won't be doing another version of her until the actual costume comes out. This is EXACTLY how I want the final result to look like in the MCU!!!!! Really hope this is!!!! Anyway, Brie Larson is the only actress PERFECT for the role, and based on the fact that I've been a MASSIVE fan for about a few years & have seen MORE than enough to prove herself, I know that she will do an INCREDIBLE job. As I was saying, LOVE THIS ART!!!!!! Thank you!!!!! that would be awesome if they used this design! i;d be happy about it!! 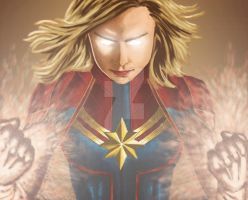 Awesoem Captain Marvel, I think I like it. do you or don;t you like it? I heard the casting news and immediately thought "Yes, I think they cracked it." she wasn't my first or second choice but a good choice. Did you get a good look at Captain Marvel in the Avengers Assemble Cartoon? Lots of similarities, but I love it! i didn't. i mostly looked at different artists take on her costume in comics, costume designs for capt america, black widow and maria hill from the movies.